One of the biggest fascinations of many kids, including mine, is space. Kids love all things planets, rockets, and outer space. 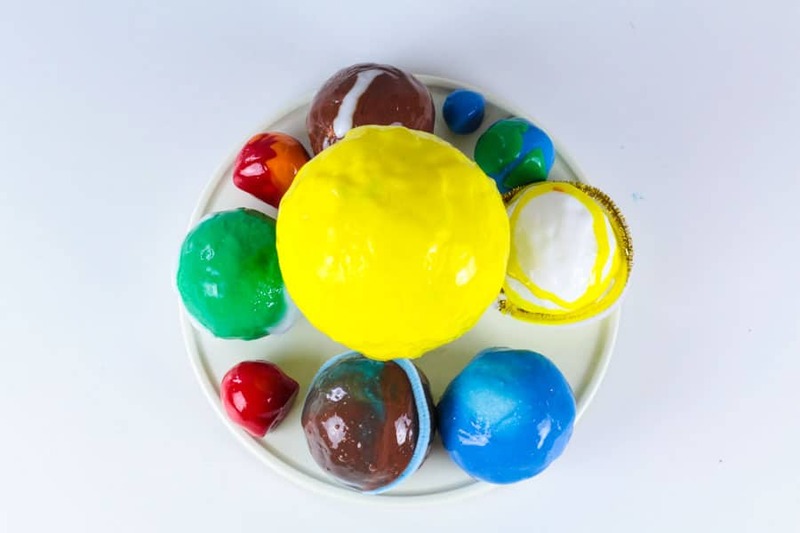 Today, we combined two of my kids biggest loves, slime and the solar system and make this fun solar system slime recipe! 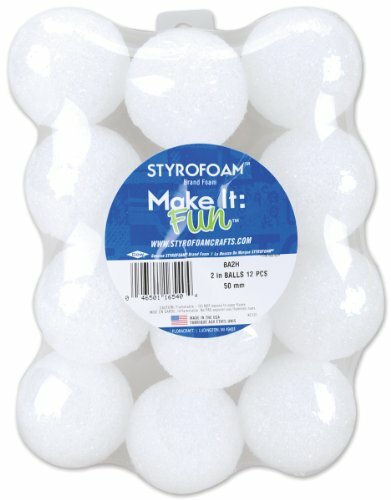 I was inspired to make the solar system out of slime when I saw how much fun it was to put slime around a Styrofoam ball when we made snowman slime. 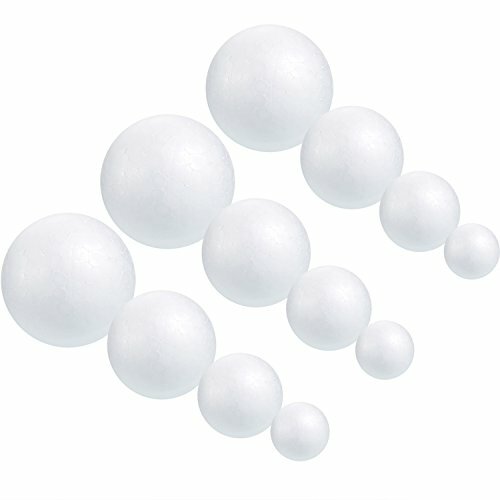 I knew if we used a bunch of different sized balls, we could make planet slime and recreate the entire solar system in slime! 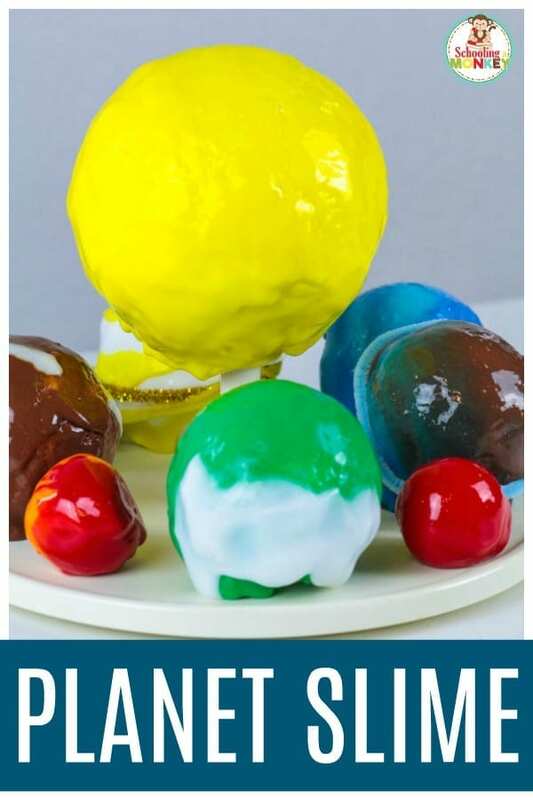 The biggest difference between this slime and our favorite slime recipe is that this version is slightly thicker, so that it doesn’t automatically slide down the balls and create puddles of planets. We also added lotion, because lotion slime is all the rage with my kids right now. 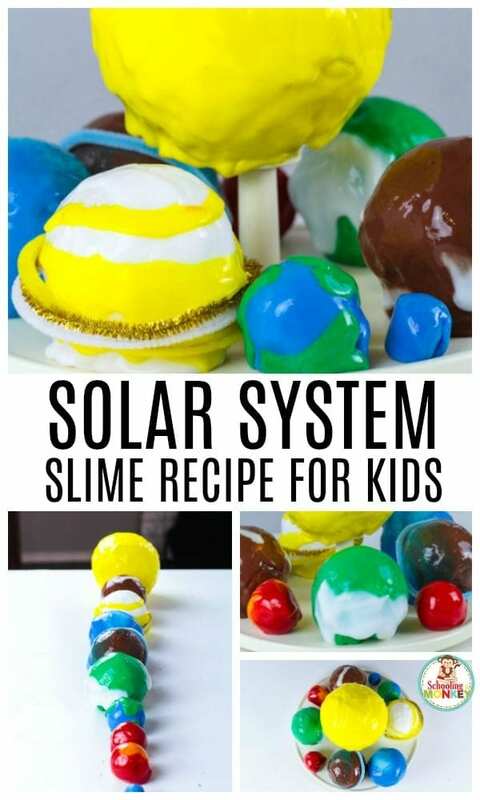 Read on to see how to make your very own solar system slime! 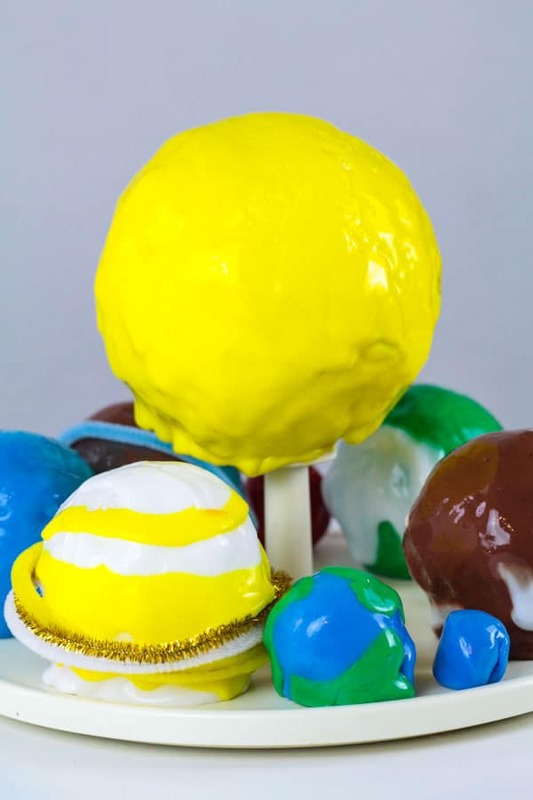 Make this easy planet solar system slime recipe and have fun while learning all about the solar system. 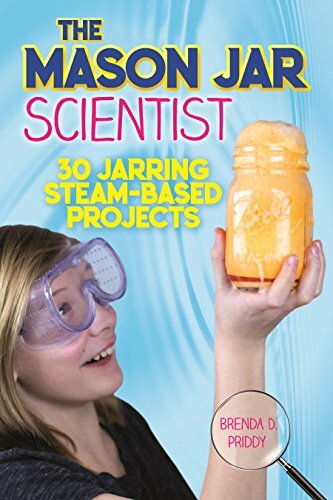 WHAT CAN KIDS LEARN BY MAKING PLANET SLIME? 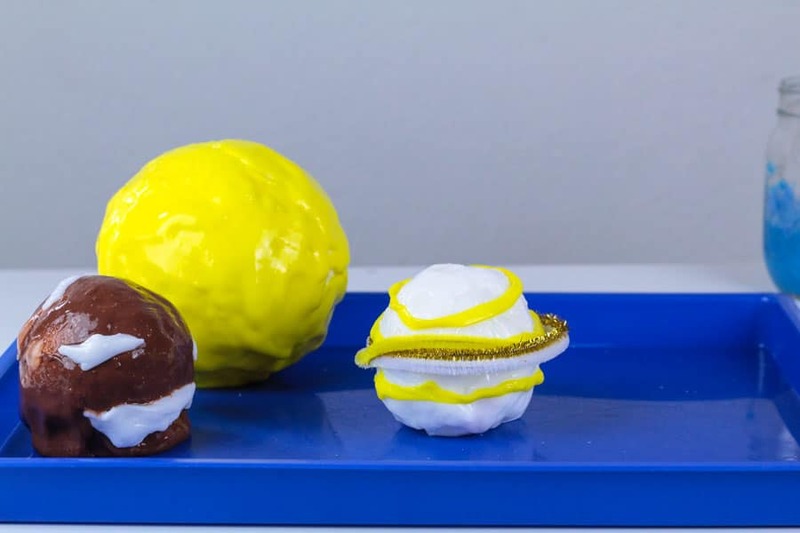 When you’re recreating the solar system in slime, it’s the perfect time to learn about the planets in our solar system. 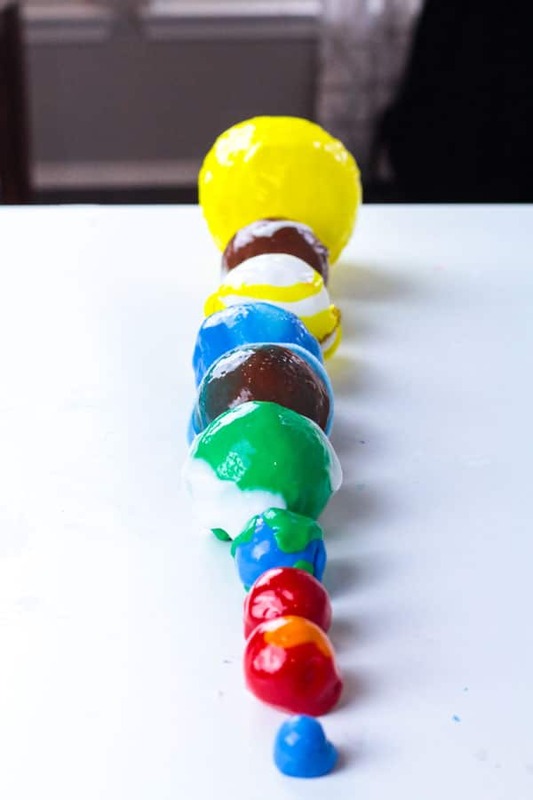 When making this slime activity, kids can learn about the order of the planets, what each planet is made of, how far away the planets are, as well as learning about chemical reactions and polymer chains from making the slime itself. 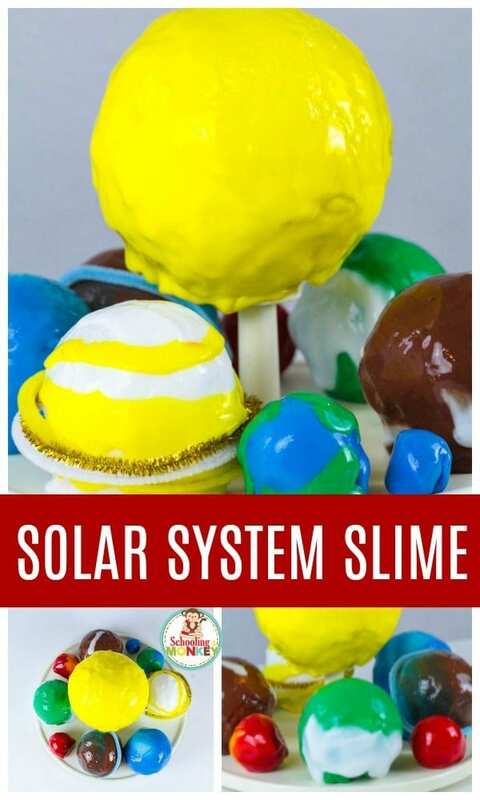 WHAT DO KIDS NEED TO MAKE SOLAR SYSTEM SLIME? 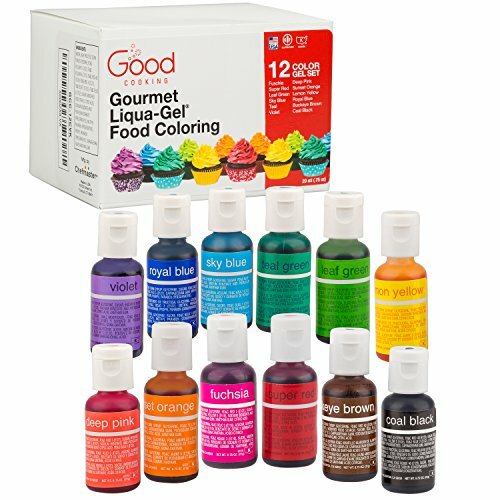 Since this slime is slightly thicker than most, you’ll need a few different ingredients than usual. 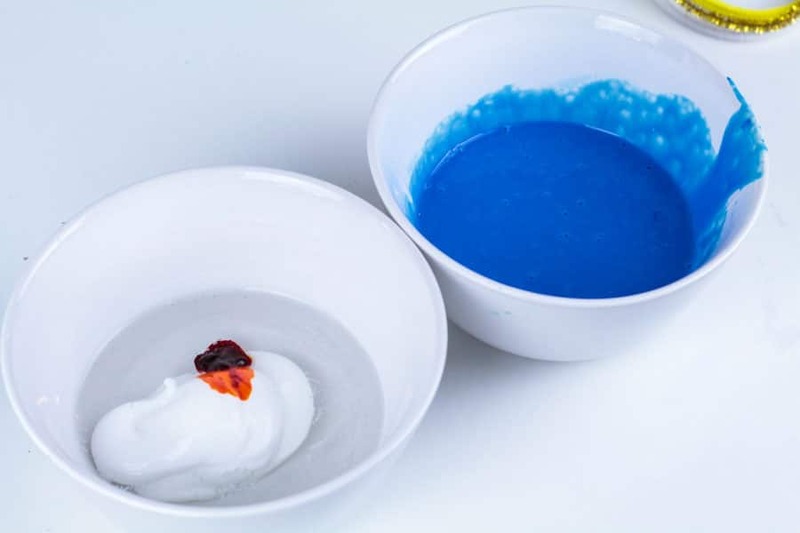 The secret to making perfect slime is mixing the coloring, glue, and lotion first. 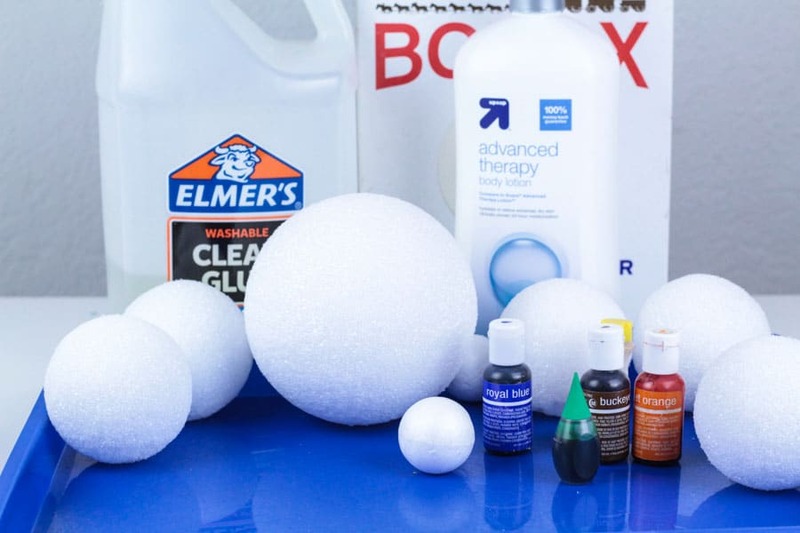 Then you can add your activator to turn it into real squishy slime. 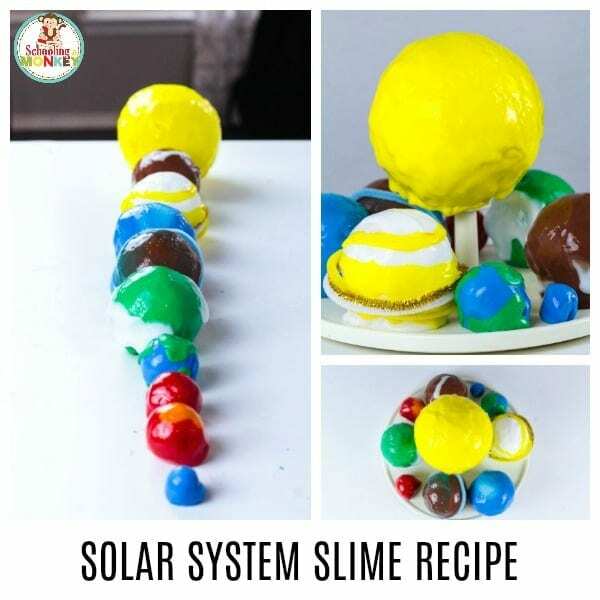 Follow these steps to make your own solar system slime recipe! We used one large ball for the sun, four smaller balls for the largest planets, four even smaller balls for the other planets, and one tiny ball for Pluto. You can leave Pluto off if you want, but we decided to use it. 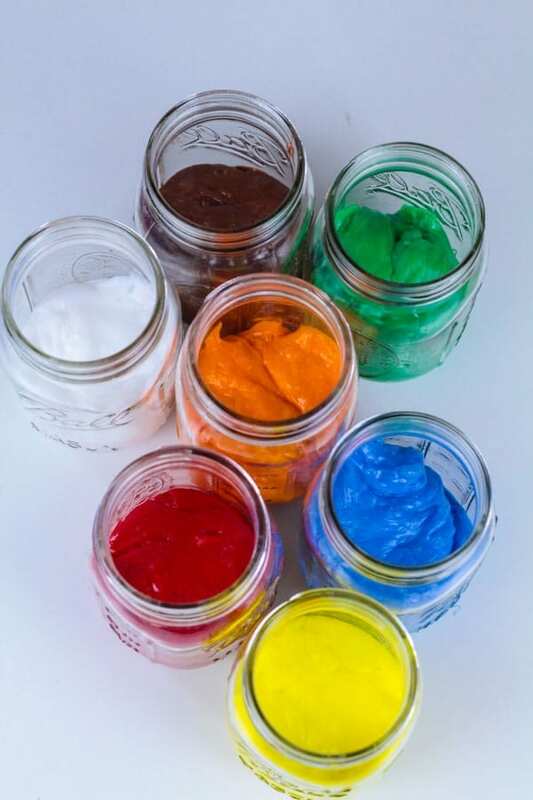 Mix up your slime by mixing 1/2 a cup of glue, 1/4 a cup of lotion, and food coloring in each jar (if you need slime mixing help, check out our slime troubleshooting guide). 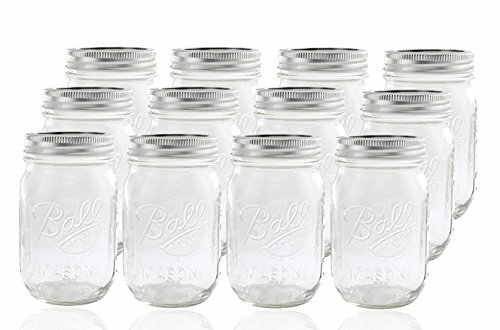 Mix five cups of water and five teaspoons of Borax powder. 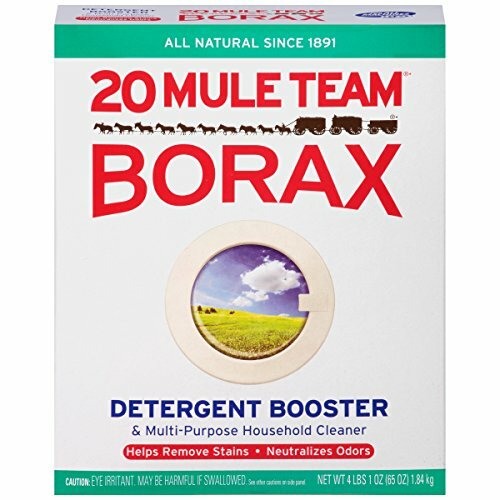 Pour a bit of the Borax liquid into each bowl. Stir and knead until the slime forms. 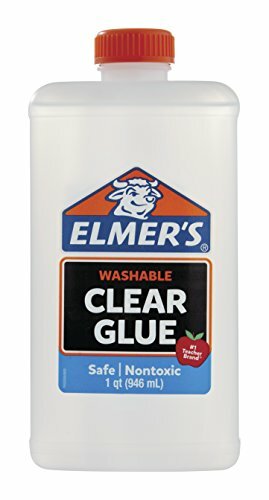 You may need to add a bit more Borax water if your slime is too sticky. 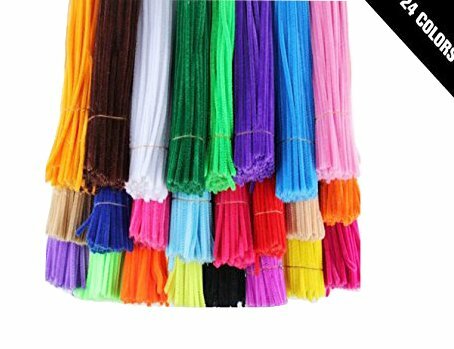 Use pipe cleaners to make the rings around the planets that have rings. 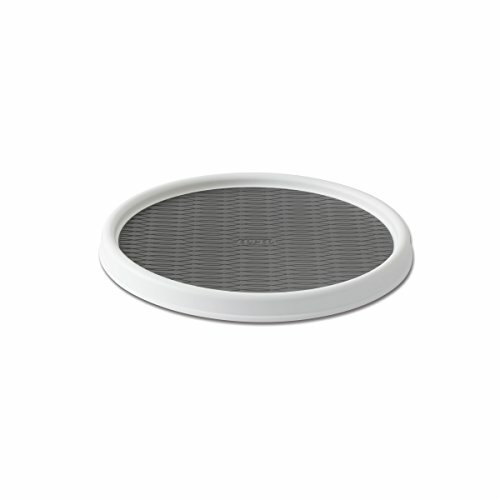 Place the planets on a rotating tray so they can spin around in orbit around the sun.